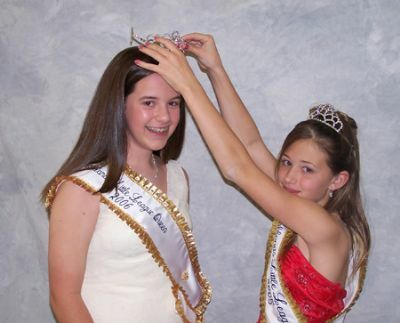 HIGHLANDSFifty years ago, the Highlands Little League crowned it first queen. Now, Shelbi Wallace will join the ranks of those who wore the crown as her team, the Major Braves, was named the top fundraiser with $7,711 at the Queens Pageant Friday. Diana Singer, the 2003 Queen, was named first runner-up with the Major Indians bringing in $7,420.95. The Minor I Astros raised $3,939, earning their queen Briana Pipkins second runner-up. The bulk of the pageant featured contestants competing in three talent divisions. In the Pee Wee Talent class, Lyndsey Wests performance of the song Bare Necessities won her first place. Savannah Pipkins placed second and Cassandra Weber came in third. Singing Precious Lord, Maegan West won first place in Junior Talent. Briana Pipkins placed second and Morgan Flowers took third. Rebekah Stombaugh won first place in Senior Talent by wowing the judges with her Irish Step Dance routine. Shelbi Wallace finished second while Misty Wilson took third in Senior Talent. A tradition of the Highlands Little League is a preseason Fun Day in the Park. Among the many activities on this day is a home run contest for the youth. During the pageant, Mickey Masterson announced the home run contest winners. Winners are: 5-6 year olds Seth Stockwell and Tony Brindza tied for first and Hunter Kratke and Michael Sims tied for second. In the 7-8 years olds Briant Carter and Kyle Davis tied for first, J.T. Ayer placed second and Williams Sims came in third. The 9-10 year olds featured a four way tie for first place between Colton Boudreaux, Joseph Cross, Theron Stockwell and Coby Vondenstein. Chance Czerwonka won the 11 and 12 year olds class, with Colton OBrien placing second and Jerod Bickle and Brigham Rushing tying for third place.